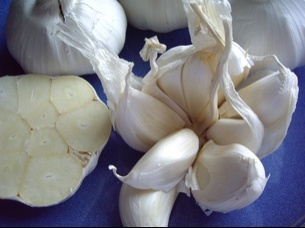 This is a picture of whole bulbs of garlic. 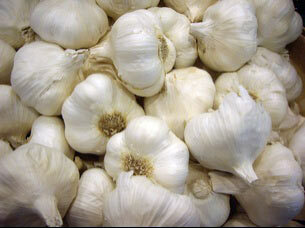 It is made up of 10-16 cloves, and each clove is covered in a papery like skin. There are two very efficient (and fun) ways to remove that papery skin. 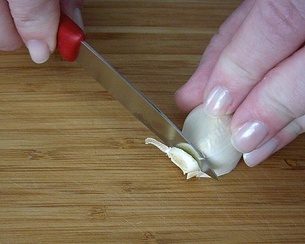 One way is to first cut off the base of the clove. 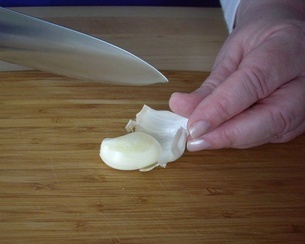 Then place the clove on a board, and gently slam it with the flat side of a big knife. 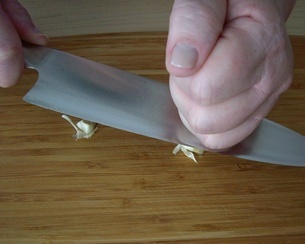 Be sure the sharp edge of the knife is pointed away from you. 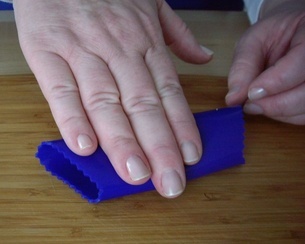 The skin should burst so that you can then remove it. A very satisfying activity! …and the skin magically slips off the clove. This tube is like a soft silicone canolli pastry shell. They do cost about $8, which is kind of expensive when you could just use the flat of your knife. 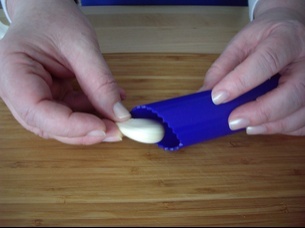 Next, we’ll talk about slicing, mincing and crushing garlic. 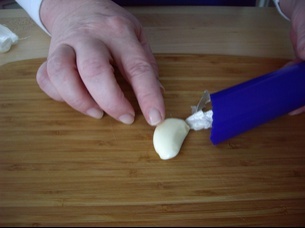 I think the slam technique is so much fun; however, my garlic press doesn’t require me to take the skin off prior to use, so I usually just put the clove in, skin and all! 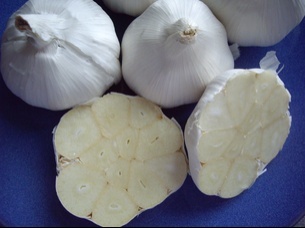 I bought one like that and most of the garlic stays in the press along with the skin! Oops! It’s worth pointing out to the ‘startingcooking’ readers that one can of course simply ease a single clove or two away from the bulb and then top and smash that. It’s not necessary to use the whole bulb.